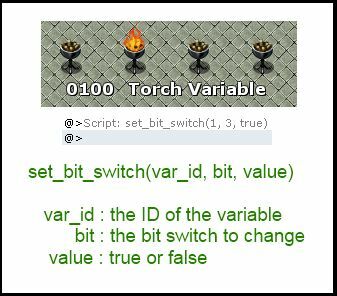 This tutorial goes over a technique you can use with game variables to convert an event that might require several switches in order to implement. Consider a puzzle consisting of four torches as shown above, where each torch controls a separate door, and different combinations of torches control different doors. If torch 1 and 3 are ON, then door A will open. If torch 1 and 4 are ON, then door B will open. If torch 2 and 3 are ON, then door C will open. If torch 1, 2, and 4 are ON, then door D will open. One way to set up this puzzle is to use four switches, one for each torch. That is a very simple solution and gets the job done. However, what if you had 100 torches? Will you reserve 100 switches? 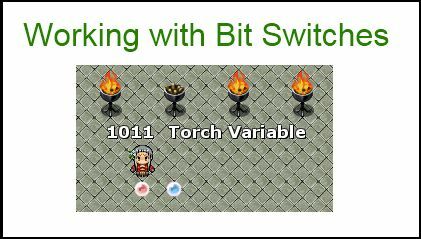 The solution I propose is to use Bit-Switches, which allow you to use a single variable to maintain all of these switches. Bit-switches are read from right-to-left. If a bit is not shown, then it has a value of 0. Suppose our variable initially has a value of 0. That means no torches are lit. 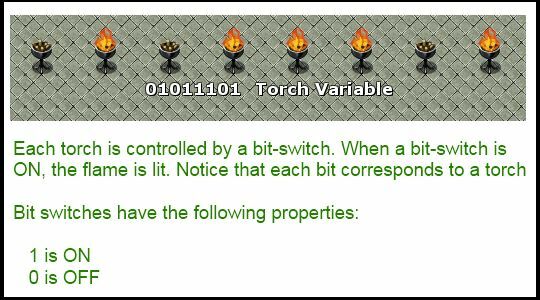 If you want to set multiple bit-switches, you can set each switch manually. 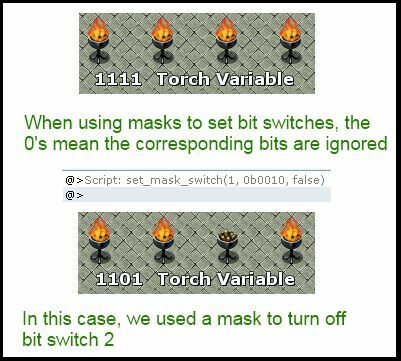 Alternatively, you can use a bit mask and use the set_mask_switch script call. The first mask will set the 1 bits to ON, while the second mask will set the 1 bits to OFF. So the script call above will turn ON bits 1 and 4, turn OFF bit 3, and ignore bit 2. 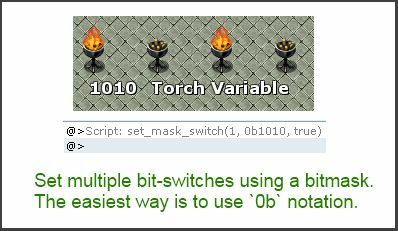 You can use a bitmask to check multiple bit switches as well. Again, only the 1 bits in your mask will be checked, while the 0 bits are ignored. Use the mask_switch? script call to check multiple bits to see if they’re ON or OFF. Because you can only check for one type of value using a mask (ON or OFF, not both), you will need to perform multiple checks if you require certain bit switches to be ON, while certain bit switches are OFF. Which first checks that bits 1 and 4 are ON, and then checks that bit 3 is OFF. Notice that bit 2 is completely ignored because we don’t care about that value. This is equivalent to the previous script call. The first mask checks for ON bits, while the second mask checks for OFF bits. Any bits that aren’t checked will be ignored. Sometimes you might be using the same bitmasks repeatedly in multiple places. Just think about how often you have the same switch condition in multiple events. If you decide to change your bitmask, then you would have to update every script call. To make your projects more manageable, you can use “named bitmasks”, which is essentially associating a bitmask with a constant name that you can use in your script calls. To create named bitmasks, go into the script’s configuration section and add new entries into the table. The keys are the bitmask names, while the value associated with a key is the bitmask. Bit switches may seem difficult to use at first, but once you have figured out how to set and check them, they should make complex events with many switches easier to manage since you can easily check multiple switches at the same time. This is legendary! you make the makers job easier.